The waters are receding in east Texas, and the waterlogged area is beginning to transition from emergency mode to the dirty, extensive work of long-term recovery. Fuller Center Disaster ReBuilders leader Bart Tucker said Tuesday that his group anticipates having a base camp established soon in the Texas City area, where they hope to host volunteer teams as soon as possible — perhaps by the end of September. This work comes on top of the disaster work the ReBuilders and the Ginger Ford Northshore Fuller Center for Housing is doing in Louisiana, which was hit with historic flooding in 2016. For now, the ReBuilders are needing people willing to sweat and get dirty mucking out homes hit hardest by flooding from Hurricane Harvey but will need their most skilled volunteers headed to their base in Denham Springs, Louisiana, to deal with ongoing recovery efforts there. Fuller Center President David Snell was updated on the situation Tuesday morning and said that The Fuller Center for Housing will set up registration for volunteer teams to head to Texas as soon as possible. “The waters are receding and leaving more hardship behind,” said Snell, who has worked alongside Fuller Center volunteers in Atlantic City after SuperStorm Sandy and in Louisiana, as well as in Haiti, Armenia and other places impacted by natural disasters. “Thousands of houses in the Houston area were flooded and will require that those houses be emptied so that damaged drywall and insulation can be removed. There is urgency in this as dangerous mold will quickly set in. 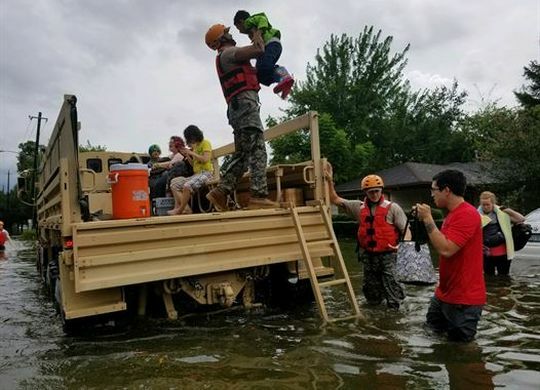 Be sure to follow The Fuller Center’s Facebook page for updates and to bookmark FullerCenter.org for news about volunteer efforts in east Texas. I’m so glad to know that The Fuller Center will have “boots on the ground” shortly in Texas! Best of all, I know that donated money will actually go toward WORK ON HOMES and not for big overhead like some non-profit organizations. Onward and upward … and thank God for The Fuller Center.